Don’t tell me, I’ve seen this before. They’re like flying paperclips, right? Not quite. 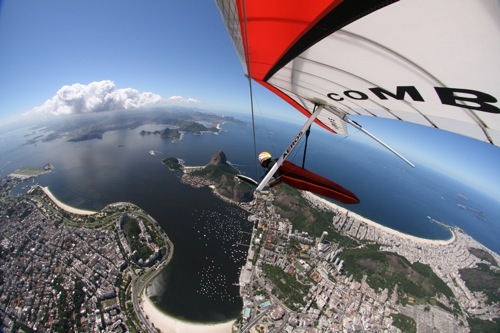 Hang gliding is an air sport in which trained pilots fly a glider using only the wind and thermals to stay aloft. There is no motor involved, not even to get into the air. The glider is fully controllable – pilots can land where and when they want and travel big distances. The world distance record is over 700km. It’s the closest man has got to flying like a bird. Are they really hanging there? In the very early days of the sport – the early 1970s – pilots would literally hang by their arms onto the base bar of the glider. The trick was only to go as high as you dared fall. Obviously this meant very short flights on small hills. But the gliders and the sport developed, so now the pilots are suspended securely in a harness. The pilot is suspended in a harness beneath a nine-metre sail – the wing – which is made of fabric stretched over an aluminium or graphite frame. He or she can move themselves around like a pendulum underneath the wing by holding onto an aluminium A-frame. When the pilot shifts left the wing banks left and they start to turn. To speed up pilots pull themselves through the A-frame, the weight shifts forward and the hang glider goes into a nose-down position. To slow down the pilot pushes the bar away from them and the wing’s nose lifts up slightly, and the glider slows down. It looks graceful in the air, but sort of heavy on the ground. How do they launch? Three ways. In foot launching the pilot faces into the wind and runs down a slope until airborne. This is how the pilots at this competition will get into the air. Where there are no hills to launch from hang gliders can be towed up behind a vehicle, winch or boat before the pilot releases themselves at their desired height. In aerotowing a microlight tows the hang glider up to between 1,000ft and 3,000ft before launching. Between 26kg and 35kg. About the weight of a large overpacked suitcase. So how do they fly? The glider’s shape creates lift. Just like a paper plane launched from your hand, when a hang glider launches it will glide safely to the bottom of the hill. What if they hit an air pocket? There’s no such thing. “Air pocket” implies there is a sudden gap in the air – that’s impossible. What people mean when they talk about air pockets is turbulent air. That happens all the time. But the trick to flying a hang glider well is to understand the weather and not fly where there is too much turbulence. It’s like sailing – you don’t leave harbour when a storm is forecast. You don’t fly in turbulence. Even if you do, the glider won’t collapse or fall out of the sky – the pilot will just have a bumpy ride until they reach smoother air, or land. So how do they stay up in the air and travel big distances? To stay up pilots have to find lifting air. They do that in two ways: dynamic lift and thermal lift. Dynamic lift is caused by wind rising when it hits a slope. Have you seen birds soaring above a cliff on a breezy day? That’s dynamic lift. That’s caused by the sun heating the ground. When a patch of ground – say a rocky hillside – gets hot enough it starts to heat the air above it. Hot air rises – that’s your thermal. The trick to flying distance – and competitions – is to find a thermal, use it to get as high as you can, and then fly off to find another one. That’s the difficult bit. Experience, judgment, skill and some luck all play their part. In a competition like this where you have the best pilots in the world competing there is a lot of experience, so pilots will fly for long distances and cover the ground quickly. Why do they fly around in circles? That’s called thermalling. It’s how pilots stay in the lifting air. Thermals can be small and flying in a circle is the most efficient way of staying in it. So how do hang gliding competitions work? Typically they take place over a week or two. Each day a task will be set. This depends on what the weather is like, but a “good” task will involve flying around a course of 100km or more, passing several checkpoints. It’s like aerial orienteering. The fastest pilot to the final checkpoint – the goal – wins the day. Win enough days and you win the competition. A team competition runs alongside the individual competitions. A typical task will see pilots take off at 11am and land by 5pm – up to six hours in the air. It’s hard work. If you’re up there for six hours, how do you … you know? Pilots can eat, drink and take photographs fairly easily in the air. In the old days one or two have even rolled cigarettes. But relieving yourself is tricky. Some pilots use a tube that they tape to their leg and down to their shoe, others unzip in the air and … well, you get the idea. Others, including most women, just have to hang on, although there are ways, including adult nappies. It makes watching landings fun when pilots have to rush to get out of their harness and behind a tree. I have to ask, is it dangerous? It’s an adventure sport, not an extreme one. So yes, there is an element of danger and sadly accidents do happen. Accidents happen mainly on take off and landing. It is very rare for people to “fall out of the sky” for no reason. Good training, experience, and flying within your limits all help reduce accidents. Some of the pilots at this competition have been flying safely for 30 years or more. Unfortunately, when accidents do happen they tend to be serious ones. It’s the nature of the sport and all pilots know that, and accept the risks involved. It is. It’s a serious sport. The pilots involved are dedicated and work hard. Some put everything they have into flying competitively, spend all their savings, live simply, and work to fly. Most competition pilots will spend more on traveling to a competition than they ever get back from the sport either in sponsorship or prize money. So they are sports people in the truest sense – doing it because they love it and because the personal rewards are so great. OK, I get the point. How do I learn? 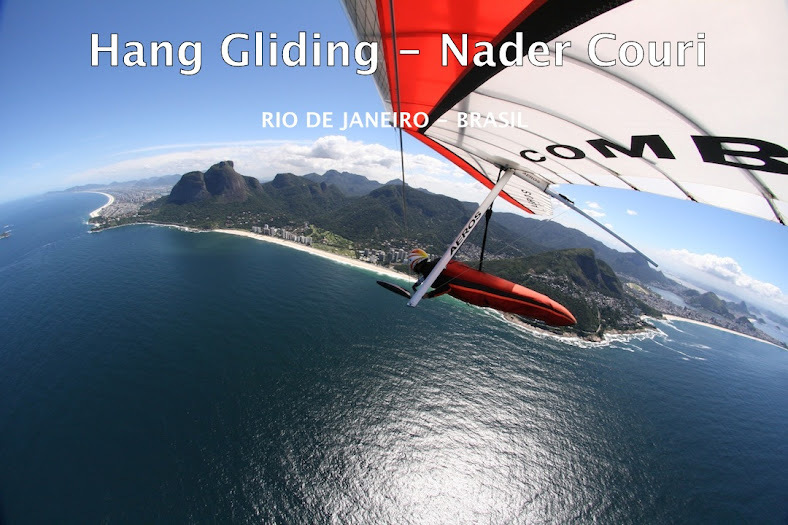 Your country will have a hang gliding association. They will be on the web. Learn with them. It’s the only way to do it. There will be clubs across your country, and once you’ve learned the basics you will be able to fly with them. You will never look back – just up. • Got news? Send it to us at news@xcmag.com. Fair use applies to this article: if you reproduce it online, please credit correctly and link to www.xcmag.com or the original article. No reproduction in print. Copyright remains with Cross Country magazine. Thanks!